A galette is a fancy way of saying “a thin pie.” This one has a crunchy dough, rich with butter that is perfect for summer’s Heirloom Tomatoes and Parmigianino. Put the flour in a bowl and chill in the freezer for 1 hour. Place the flour and 1/4 teaspoon salt and frozen butter in food processor and judiciously pulse until half is the size of peas and the other half a little larger. Transfer to a mixer. Pour in most of the water and beat on low speed until the mixture forms into a rough ball. Add a little more water if it does not come together. On a well-floured surface, roll out the dough into a 14-inch circle and trim the edges. Place on a large baking sheet and refrigerate. To avoid a soggy crust later on, you need to get rid of of some of their liquid. Here is what we do at the Beechwood Inn: Slice the tomatoes into 3/8 slices. Place the sliced tomatoes on a rack on a sheet pan and sprinkle them with the sea salt. Put it in a warming drawer or oven at about 140 degrees for 4 hours. Warm a tablespoon of olive oil in a large skillet over medium heat. Add the green onions and cook until soft, 4 to 5 minutes. Remove from the heat and let cool. Remove the pastry from the refrigerator. Spread the sliced tomatoes in concentric circles around the crust making sure you distribute the different colors of tomatoes, but leave a one inch border around the edge. Sprinkle the top with the green onions and grated cheese. Fold the uncovered edge of the pastry over the tomatoes, pleating it to make it fit. 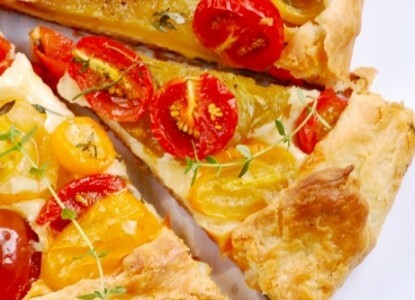 Bake the galette in the oven until golden brown, 35 to 40 minutes. Let cool for 5 minutes, and then slide the galette off the pan and onto a serving plate. Sprinkle the top with the basil chiffonade and drizzle a with a couple tablespoons of olive oil. Serve hot, warm, or at room temperature. At Beechwood Inn we use this recipe in a variety of ways. We will dollop some goat cheese on the galette before we put it in the oven. If we have some fresh garden pesto we will drizzle it with some after it comes out of the oven. To change the flavor and texture substitute Gruyere cheese for the parmegiano.